WTF?! Microtransactions in full-price games are usually a cynical cash grab by companies looking to squeeze every last penny out of consumers. It’s something Activision has long had a reputation for doing, and nowhere is this more apparent than in Call of Duty: Black Ops 4, where it’s charging players $1 for what is literally a dot. Activision has just introduced a new set of in-game items for COD: BO 4’s Black Market. One of these is an ‘Open Dot’ — a single red dot that’s used as a reticle for the Reflex sights. 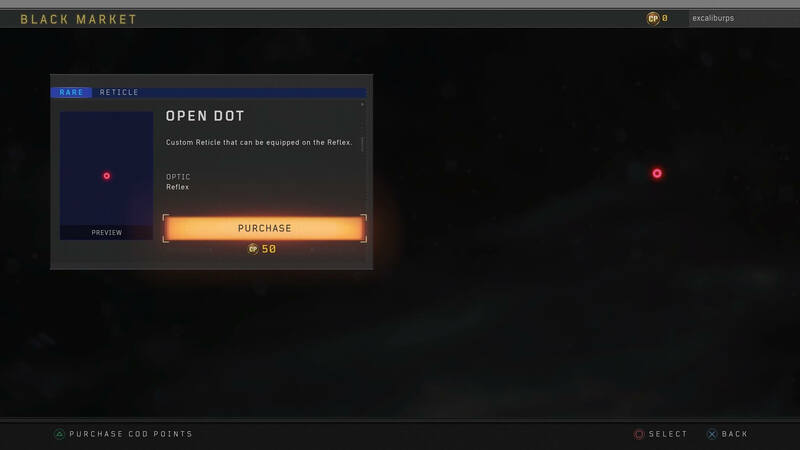 The Open Dot normally costs 100 COD points, which is the equivalent of one dollar. But, in an act of unparalleled generosity, Activision is offering it for 50 COD ($0.50) right now as part of the ‘Season’s Savings’ sale that’s running until January 1. Last year’s Star Wars: Battlefront II controversy led to a consumer backlash and several countries investigating loot boxes to see if they violate their gambling laws. Nations including Belgium and the Netherlands have banned the systems, while the FTC has promised to look into them. Standard microtransactions, on the other hand, remain a part of many full-price titles. One prime example of this is Assassin’s Creed Odyssey, which, while a fantastic game, was marred by the inclusion of microtransactions that let players level up faster (“for those who value their time”) or gave them more gold and resources. Most companies will argue that paying for additional extras in a game is entirely optional, and as long as people continue to spend money on them, there’s no reason to stop charging for things like little red dots.